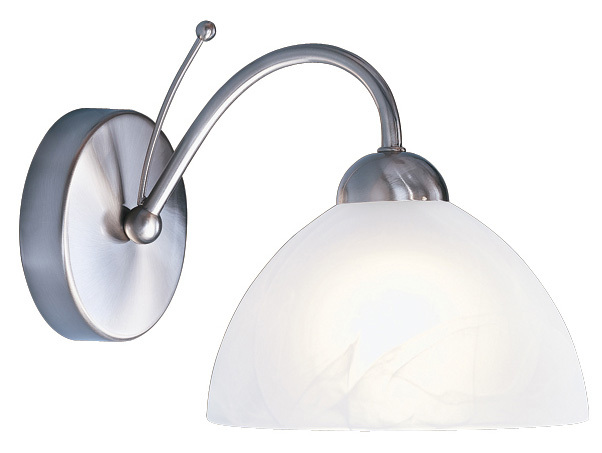 This Milanese satin silver finish single wall light with alabaster glass is classic, beautiful and traditional. Featuring a circular wall mount and curved over arching arm holding a downward facing alabaster glass domed shade or a softer light. Ideal for a traditional bedroom, hallway, dining room or living room wall. The sleek circular wall plate has a decorative metal stem and classy satin silver finish curved arm, leading on to a downward facing alabaster glass shade. The light looks simple yet stylish and is perfect for lighting any wall in your home. This classic light is supplied by Searchlight who manufacture some of the best traditional and modern classic designs such as the Milanese satin silver finish single wall light with alabaster glass you see here.